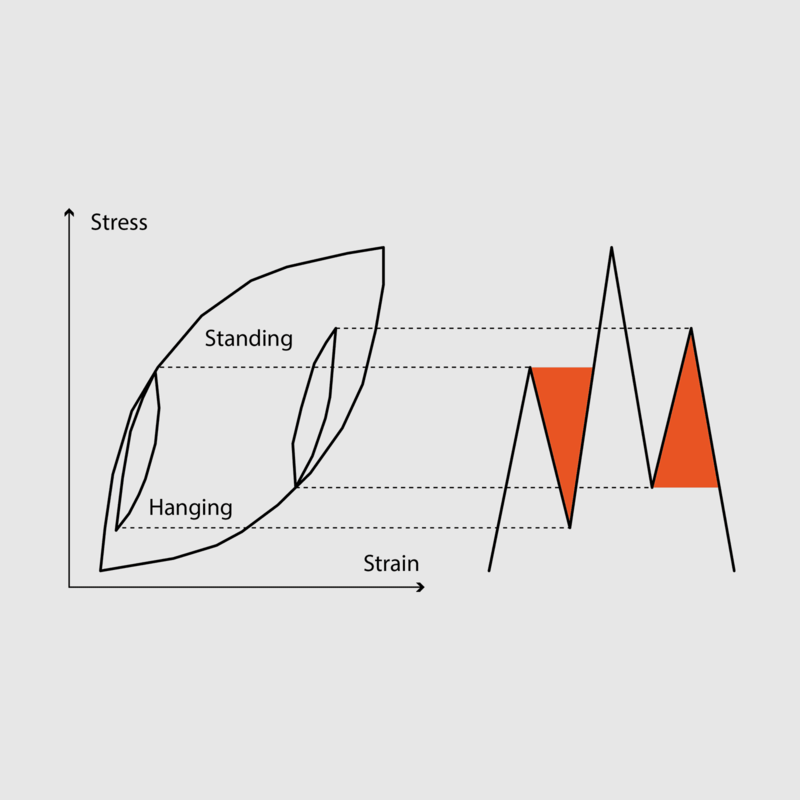 Fatigue is the progressive and localized structural damage that occurs when a material is subjected to cyclic loading. Continued cycling of high-stress concentrations may eventually cause a crack which propagates and results in leakages. Turning points filter - detects turning points (local extremes) in the signal. The filter is applied to the input signal by default and cannot be disabled since the Fatigue Analysis Module requires a sequence of turning points as its input (instead of a full load signal). Rainflow filter (hysteresis filter) - removes small oscillations from the signal. All turning points that correspond to the cycles with the ranges below the given threshold are removed. Higher the threshold, more turning points are filtered out, and vice versa. The rainflow filtering can significantly reduce the number of turning points, which can be of importance for both testing and numerical simulation. Threshold parameter of value T corresponds to the T% of the absolute load signal range. Discretization filter - divides the range of a load signal into N equidistant bins and assigns each turning point to its closest bin. Load signals are typically very stochastic, therefore, discretization is often applied to make them flatter and less stochastic. The number of bins is adjusted with the Class count parameter. Rainflow counting is generally accepted as being the best cycle counting method up to date and has become the industrial de facto standard. 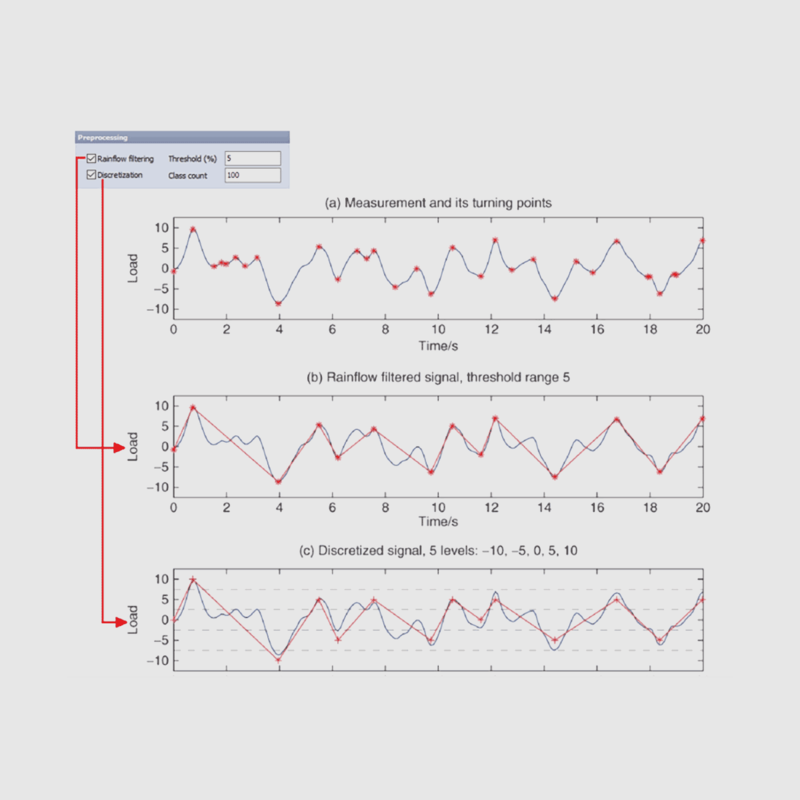 The idea behind the method is to detect the hysteresis loops in the load signal. We'll refer to the hysteresis loops as the closed cycles. Parts of the signal that do not correspond to the closed cycles are the so-called open cycles or residuals. Different rainflow counting standards, such as ASTM, DIN and AFNOR, differ with respect to the treatment of the residuals. In order to be as general as possible the Fatigue Analysis Module supports both residual and non-residual mode. 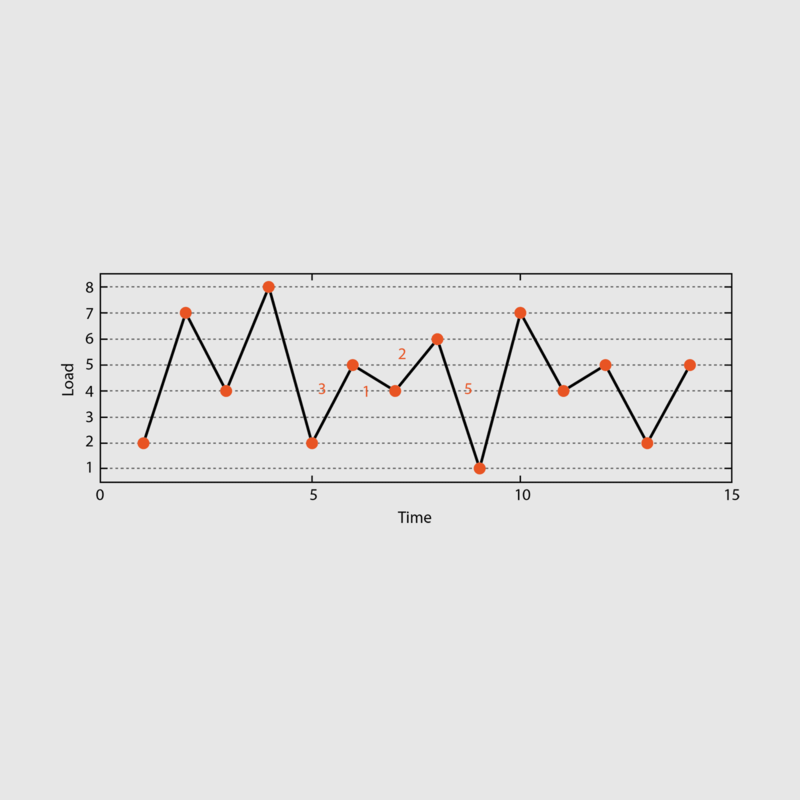 Markov counting is one of the most straightforward cycle counting methods. 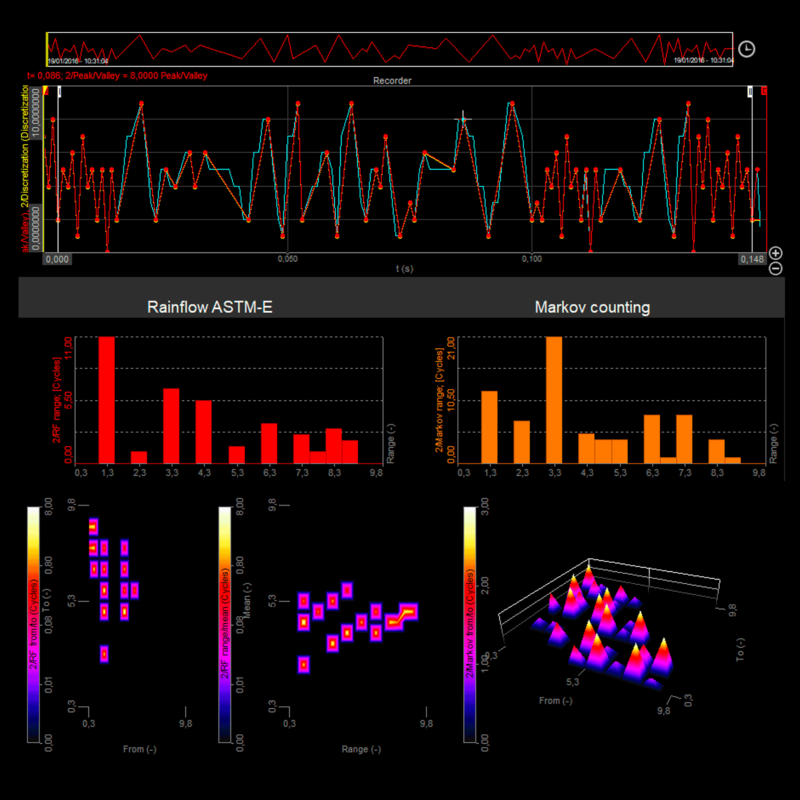 It operates on consecutive pairs of turning points and calculates absolute ranges between them. Range histograms - 2-D graph representing the range distribution of a load signal (range, number of cycles). A typical range histogram use-case would be to obtain the range histogram of a signal, rotate it over diagonal (swap the X-axis and Y-axis), overlay a corresponding S-N curve on top and check whether it stays well below the curve. Classes parameter specifies the number of classes the range is divided into. When Auto checkbox is ticked DEWESoft automatically calculates Min range and Max range from the input signal. When analyzing extremely large data files with the Fatigue Analysis Module the operating system can run out of memory. 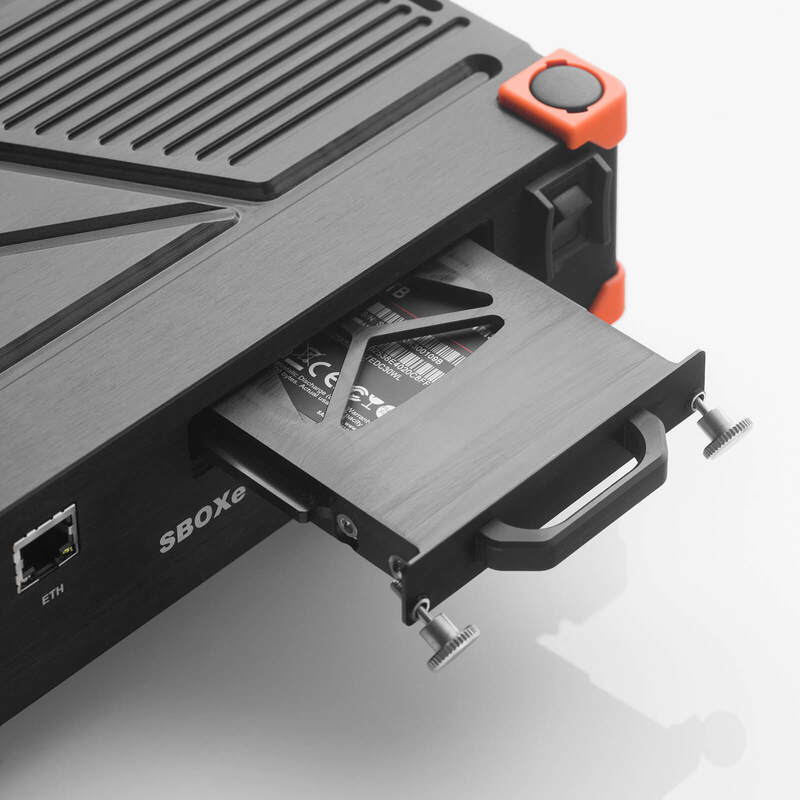 In order to be as robust as possible and avoid such scenarios, the module supports a special Hard drive mode. In the hard drive mode all the intermediate data is stored on the hard drive instead of in the RAM, thus substantially decreasing the memory consumption. You can learn more about fatigue analysis at Dewesoft PRO online training by navigating to the Fatigue Analysis PRO training course. 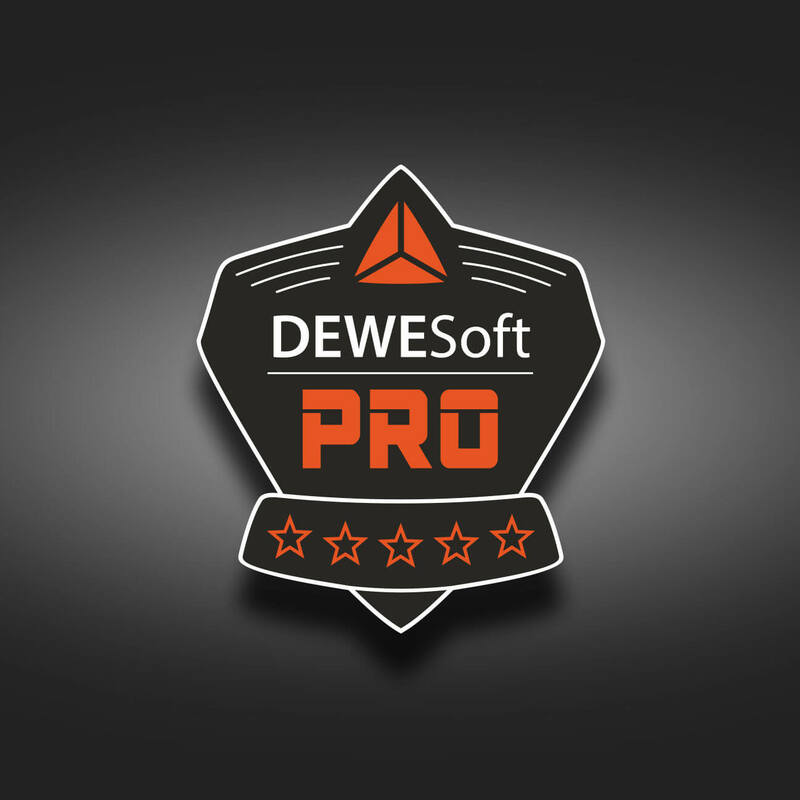 Dewesoft PRO training is a free online training for measurement professionals. 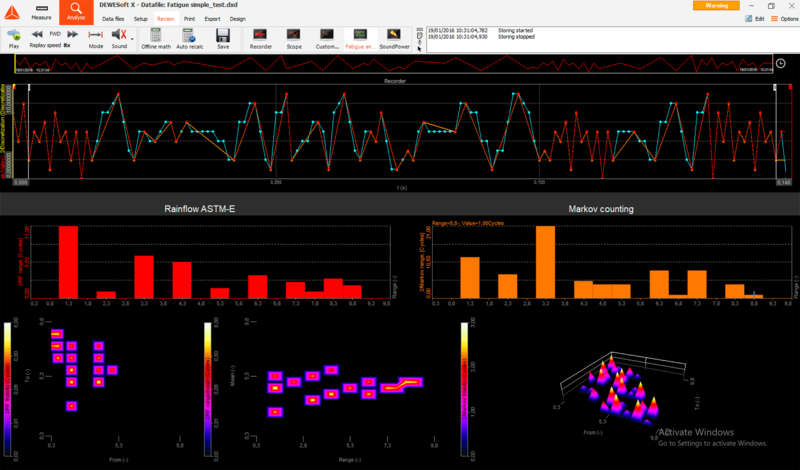 Learn how to measure signals, data processing and how to use Dewesoft products. Online PRO training is completely free.